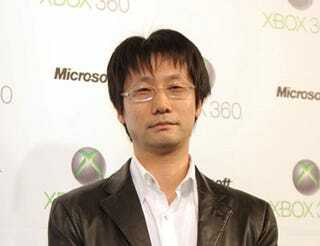 On the internet, there's stuff saying "Hideo Kojima" isn't satisfied with the PS3. I'd like to talk about that today. I just got back from Paris and did 15 interviews and everyone asked me about it, did I say that. The meaning of what I said has totally been changed, made totally different. Today, I'd like to talk about that. Why did it turn into that? When I'm doing an interview, I answer in Japanese, and I can't control how the writer will interpret that into English... What I say is then translated in English, and the writer then changes that into their own words and writes that. So, right there, the meaning of what I say changes a lot. Let's say this developer is making hardware, in this case a game, and that hardware is at the level of a car. And when looking at the specs, the developer claims the car is able to fly. Now there is no stopping when you say, "This is a car that can fly." When you claim that it can fly, the speculation grows from "oh so it can FLY?!!!" And the developer would set his goals higher. The specualtion is that if the car flies, then it should reach a MACH speed...but it doesnt stop there...it'd go beyond the specualtion of then "it should go into space!" with all the excitement around, and the developer would go deeply into making the car going into space... however, he'll come up to the public and say the car reaches the MACH speed, but it fails to go into the space. But he shouldn't give up, because for a car to even reach a mach speed and go into air is revolutionary. I wished to convey my thoughts like that, but I guess it didn't work very well. Recently I've been thinking about not giving interviews. That's not my job. My job is making games... The next time I interview in America, I will just say "MGS4 is the best, the end." It's not cool for a Japanese to speak so blatantly, and I don't want to say that. But if I don't, things like this [above] can happen... If you look at MGS4, I think you'll understand... MGS4 isn't exactly my property, so I don't have a total control over it and sometimes I get confused with it. Some may be disappointed the way I say things, but I do release the game with confidence. In fact that what I have been doing, not just this PS3 game, but my previous PS2 titles. I always reached for the higher goal and I try to go for it... Things like this often happen with Japanese newspapers. Where they take only the choice quotes. They don't change what you say, but the meaning's different, and the meaning changes. I'm always careful while giving interviews. Even in my company, im learning a lot about media training, but I wanted to do more than just that and here i am with the interview, but if things like above keep happening, I won't do anymore interviews. I don't get paid for these interviews at all. [jokingly] I won't do them anymore! I've decided! I'll stop doing my podcast! Like that. Personally I think the man is being a bit hard on himself, but that's what great minds do. So there was certainly progress made, but not enough progress...or more specifically, not enough power for progress. Apparently the team overestimated what the PlayStation 3 was capable of. Now Kojima is a well-known perfectionist, but it is a bit disturbing to see him voice his dissatisfaction with what is supposed to be the masterpiece of the franchise. If you stick your foot in it and screw up, it's always easier to shift the blame, pull the You-Don't-Understand-Us-Japanese card or gloss over important details like, you know, reading. This wasn't a cultural misunderstanding or blowing things out of proportion, this was a PR disaster. Granted, maybe Kojima, after all these years, really isn't that savvy about dealing with the Western press. Maybe, he expects people to understand that he only uses double talk and metaphors — because those are much easier for everyone to grasp. When in Rome, don't do as the Romans do! This really begs the question: We understand why Kojima might be humble about his own game (fair enough! ), but why be "humble" or make excuses for the PLAYSTATION 3? Last we checked, Kojima doesn't work for Sony.